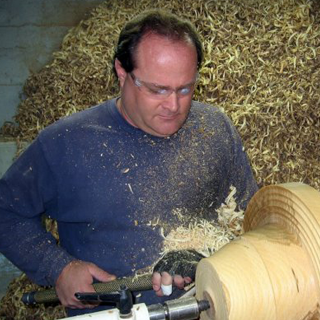 Chris Ramsey is a woodturner from Somerset, Kentucky who has been turning wood for 25 years. Chris is best known for his turned and carved sculptural bowls as well as wearable wooden hats. "I visited a store in Old Town, Berea, KY, and spotted a beautiful natural edge bowl made by a local artist named Rude Osolnik; that was the spark that lit the fire in me to pursue woodturning as a hobby." Since then, Chris's work has been exhibited in galleries, craft shops, private collections, corporate collections, permanent collections and museums in North America, South America, Asia, Europe and Africa. In 2003 he was invited to the White House by President George W. Bush for a ceremony in the Oval Office to present the sitting President with one of his turned wood cowboy hats.